It has never worked! And it certainly does not work in the 21st Century when technology and the global nature of business means busy Business owners and executives are required to be communicating and making important decisions 24/7. The demands of work have never been greater. Lifestyle expectations have never been higher. How does it all work? Certainly NOT through attempting some kind of balancing act! 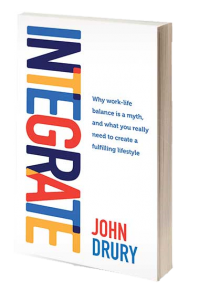 Integrate: Why Work Life Balance is a Myth and what you really need to create a fulfilling lifestyle.